Digital Secretary Matt Hancock will today visit Paris to announce a package of measures to strengthen ties between the UK and France’s digital industries. The aim is to boost both countries’ digital economies and forge closer links between cutting-edge companies from both nations. Mr Hancock will address a landmark bilateral conference on data and the digital economy alongside his French counterpart, Mounir Mahjoubi. 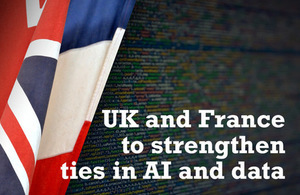 He will confirm the UK’s world-leading centre for AI and data, The Alan Turing Institute, is signing an agreement with the French institute, DATAIA, to promote collaboration between the French and British sectors. It will see the two organisations pursue collaborative research in areas of shared interest - for example, in fairness and transparency in the design and implementation of algorithms. At the UK-France Digital Colloque - a summit of more than 350 businesses, researchers and officials from both countries - Mr Hancock and Mr Majoubi will also sign an accord on digital government. This will commit to extending their cooperation in the digital sector - on innovation, artificial intelligence, data and digital administration. Mr Hancock will also confirm London-based Entrepreneur First, a beacon for the UK’s excellence in developing tech talent, is to continue its global expansion with a new Paris office. He will also bang the drum for British tech and promote the opportunities for business-to-business collaboration at a breakfast meeting with business leaders. The UK is a digital dynamo, increasingly recognised across the world as a place where ingenuity and innovation can flourish. We are home to four in ten of Europe’s tech businesses worth more than $1 billion and London is the AI capital of Europe. France is also doing great work in this area, and these new partnerships show the strength and depth of our respective tech industries and are the first stage in us developing a closer working relationship. This will help us better serve our citizens and provide a boost for our digital economies. The fundamental goal behind all our research is to build a data and AI enriched world for the benefit of all. In order to do this, it is critical to forge international collaborations and share our knowledge, expertise and ideas with other research centres around the world. The Institute and DATAIA both share a vision for building research in data science and AI which crosses disciplinary boundaries and recognises the societal implications of data and algorithms. It is a pleasure to kickstart this engagement and we look forward to working with them to advance UK and French excellence in this area. EF exists to enable the world’s most ambitious people build extraordinary companies. It was founded in London, where we’ve already helped spark the development of high growth companies from scratch. As we continue our global expansion we’re looking forward to working with France’s future founders and strengthening the ties between business and investors in both countries. The UK and France are world leaders in the digitisation of public services and are developing a data ecosystem which supports policy makers, corporates and startups using data from across the spectrum of closed, shared and open data. The Digital Colloque will see leading policymakers and industry experts discuss the technologies revolutionizing the world. It follows the commitment made by the President Emmanuel Macron and Prime Minister Theresa May during the France-UK Summit in January 2018 to boost cooperation in these fields. This Colloque builds on the success of the inaugural UK France Data Summit 2017 in London and the UK-France Summit in Sandhurst in January 2018, where both countries agreed to foster bilateral discussions on digital issues. It comes ahead of the French presidency of the G7 in 2019 and British presidency in 2021 to promote their shared vision on Global challenges. More than 350 businesses, researchers and officials from both the UK and France are due to attend the Colloque. Entrepreneur First (EF) was founded in London in 2011 by Matt Clifford and Alice Bentinck to connect the world’s most ambitious technologists to the best investors globally. EF’s bespoke programme, the first of its kind in the world, helps outstanding individuals to find co-founders and investment, and build high growth technology companies from scratch. Entrepreneur First, started in London in 2011, is a beacon for the UK’s excellence in developing tech talent, and already has sites in Singapore, Berlin and Hong Kong. Its alumni include Magic Pony Technology, led by Rob Bishop and Zehan Wang, which was acquired by Twitter for £150m. Magic Pony’s founders, Rob Bishop and Zehan Wang, studied together at Imperial College, and met at Entrepreneur First. To date EF - which opened its Singapore office in 2016 and this year opened in Berlin and Hong Kong - has helped over 1,000 individuals build over 150 companies with a total valuation of over $1 billion. EF’s companies have been funded by some of the world’s leaving venture investors in Europe and Silicon Valley. And EF itself has also raised from some of the world’s best investors,including Reid Hoffman (founder of LinkedIn), Demis Hassabis (founder of DeepMind), Greylock Partners, Mosaic Ventures, Founders Fund, Lakestar and more.